The bike comes with an overly tall gear of 16-43-112-525. l changed that to 15-45-112-520 but then quickly went to 15-47-114-520. This got my gearing right in line with the speeds, power band and internal gearing of this bike. I also changed to a 520 chain. I am not doing the 520 chain for any real performance reason. It's just that all of the gears that I have in my stash are 520, and I expect to buy only 520 gears in the future. In time, it will get much cheaper to experiment with different gear ratios and rear wheel positions. In my chain stash, I now have a 110, a 112, and a 114 link 520 Chain. 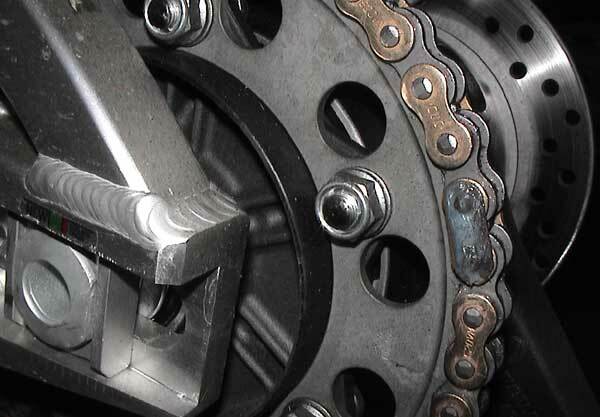 I use clip-type links to connect my chains rather than rivet-type links. I would use the rivet-type if I was on a 1000cc bike, but not on a 600. The clip-type allows me to quickly remove the chain to clean it. RTV should always be used over the clip to prevent it from sliding out of place. I save the stock gears and chain for when I go to sell the bike. That way I keep all of my trick gears and chains for the future and get a better price selling my used bike. Stock configuration measured center to center from counter shaft to rear axle is 25 7/8"